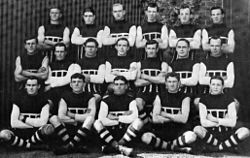 There are several varieties of football, notably association football, gridiron football, Australian rules football, Gaelic football, rugby league and rugby union. The number of players selected for each team within these varieties and their associated codes can vary substantially. 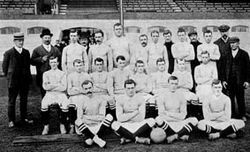 Sometimes, the word "team" is limited to those who play on the field in a match and does not always include other players who may take part as replacements or emergency players. "Football squad" may be used to be inclusive of these support and reserve players. ^ Association, The Football. "Law 3 - The Players". www.thefa.com. Retrieved 2017-05-31.